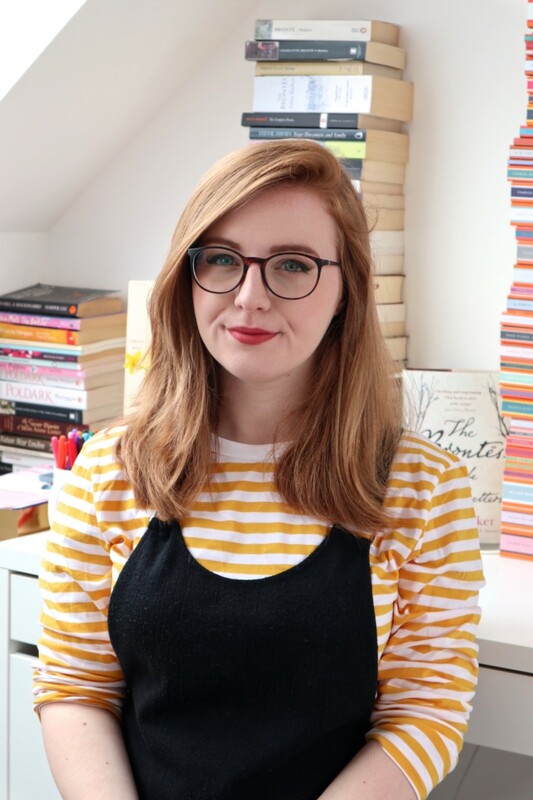 I used to LOVE writing book haul posts — I’d do them every week and join in with all the different features, from In My Mailbox to Letterbox Love to Stacking the Shelves. 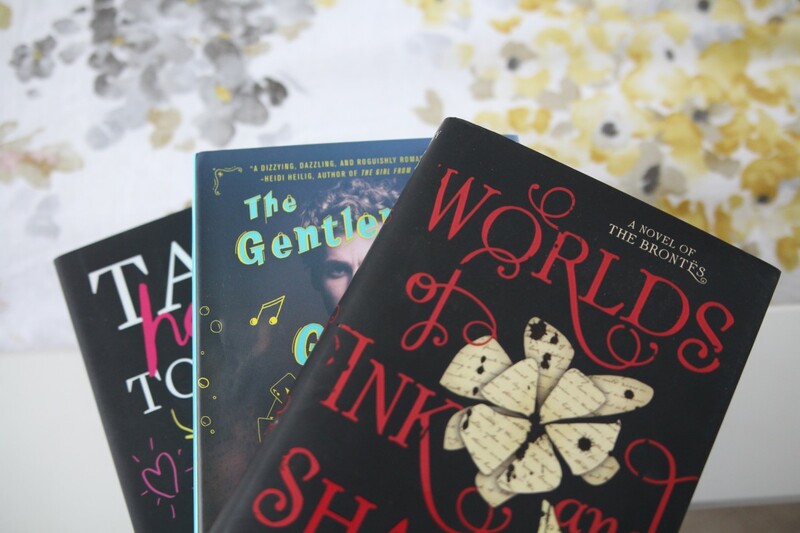 It was one of my favourite parts of blogging and I love talking about the books I’ve recently bought or received for review. 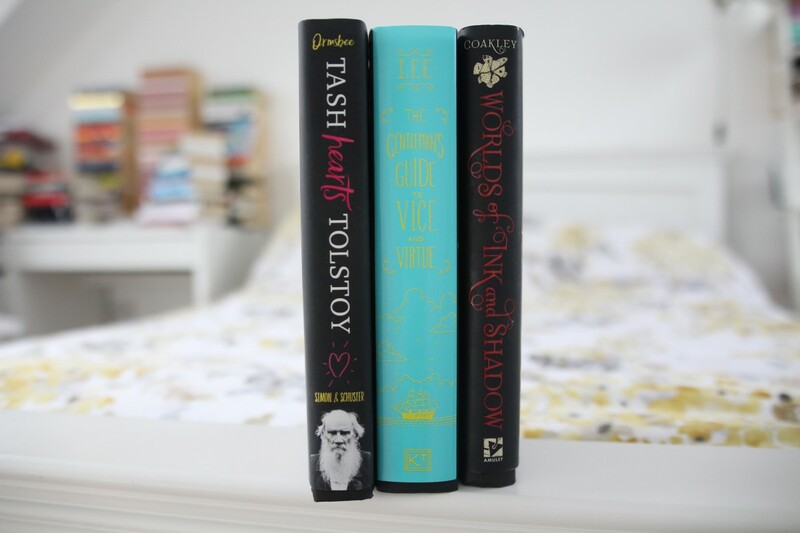 So I decided that I would bring back the book haul feature! My lovely friend Stacey, who writes one of my favourite blogs Pretty Books, visited me at the weekend and we went around lots of the bookshops in Bath, which was obviously an excuse to go a tiny bit crazy with the book buying. Coupled with this, I decided to treat myself to some American hardbacks to celebrate finishing my novel and finishing my exams. Ever since I heard Jenna talk about Tash Hearts Tolstoy, I’ve wanted to read it. It’s about Tash who has a web series based on Anna Karenina because she is obsessed with Leo Tolstoy (hence the title!). When one of the Internet’s most-famous vloggers gives her a shoutout, she’s suddenly thrust into the limelight. It sounds nerdy and full of fandom culture, and is supposed to have amazing asexual representation too. I love books that deal with Internet culture because the Internet is such a big part of my life, so I can already tell that I’m going to adore this book. Plus, look at Leo Tolstoy rocking out on the spine! Not something I ever expected to see on a YA book, but it is incredibly cool. The Gentleman’s Guide to Vice and Virtue has been one of my most-anticipated releases of the year and I’ve seen so many people on my Twitter feed talk about it. It’s a historical fiction novel, which I always enjoy and don’t think enough of it is published, about Henry “Monty” Montague who is embarking on his Grand Tour of Europe with his best friend, Percy. The trip should give Monty the perfect opportunity to have a wild last year without responsibility and the chance to flirt with Percy, who he has a massive crush on. The problem is one of his reckless decisions causes a manhunt across Europe, which will call into question everything he knows. How amazing does that sound?! It hit the New York Times bestseller list when it was first released and sounds like a funny coming-of-age novel set hundreds of years ago. I’ve never read a book about the Grand Tour before, but it’s something I’m very interested in knowing more about. I’m keeping my fingers crossed that I will love this! Based on the Brontë children’s juvenilia, Worlds of Ink and Shadow is told in third person from Charlotte, Branwell, Emily and Anne’s perspective. As any faithful reader of my blog or viewer of my YouTube videos will know, I am rather obsessed with the Brontës. Taking the stories of Glass Town and Angria, which was inspired by a set of toy soldiers that Branwell was given, Lena Coakley recreates the juvenilia with key characters from their writings. I have to admit that I bought the book mainly because I was curious about it, and not because I think I’ll enjoy it. Whilst I love reading about the Brontës and loved Sally Wainwright’s adaptation To Walk Invisible, I’m not sure how I’m going to feel reading about them as if what’s being written about is the truth — with an adaption, when you can see the actors, it’s easier to feel as it’s just one adaptation of their lives, but a book feels more realistic and more personal. We’ll see! I don’t usually read a lot of fantasy, so for me to be excited to read one is a nice change. UKYA fantasy is always great, too, especially as so much of the YA fantasy genre seems to be by US authors. I shall be reading it soon and reporting back! Is this purchase really much of a surprise? Of course I was going to buy a Brontë book! I love the Brontës’ juvenilia and think it’s a pleasure to read — it’s not always perfect, but that’s what makes it so special. It’s full of immoral characters and epic adventures, and the thing I find most fascinating is watching the progression of Charlotte’s writing from her younger fiction to her novels like Jane Eyre. Even though I have a different version of the Brontë juvenilia, I think this edition — the Penguin Classics one — has a better introduction and set of notes, plus a few extra stories that my other edition doesn’t have. From the extracts I’ve read so far, I’m sure I will enjoy it. Becoming Betty is about Lizzie, who reinvents herself as Betty to achieve the goals on her to-do list: 1. Start college. 2. Become cool. 3. Join a band. 4. Makeover. I’ve been loving band-related books recently, but have read a lot that are about boy bands, so it will be nice to read a book about music that isn’t centred around fame and celebrity. Eleanor Wood’s books sound really funny and uplifting, and I’m always looking for more contemporary books to love. I’ve already started reading Waverley, but I was reading it from a Kindle edition which didn’t have any notes and I’m sure, because of the complicated history of the story and the expectation that soon the characters are going to break into strong Scottish dialect, that explanatory notes are a must when reading Sir Walter Scott’s books. I’ve heard very mixed reviews of Waverley but I’m enjoying it a lot so far; it’s different to what I would usually read, but I wanted to read Sir Walter Scott’s books because of his connection with the Brontës — his books influenced their writings, especially Emily’s. Waverley was insanely popular when it was first written, with the whole of the UK on tenterhooks to find out who the author was — originally, Sir Walter Scott was a poet, and he published Waverley, one of the first examples of historical fiction, anonymously. Will it have stood the test of time? I shall have to see! I love books about books, and I’ve wanted to read How To Be A Heroine ever since I saw a post about it on Ruby’s (long-abandoned) blog. 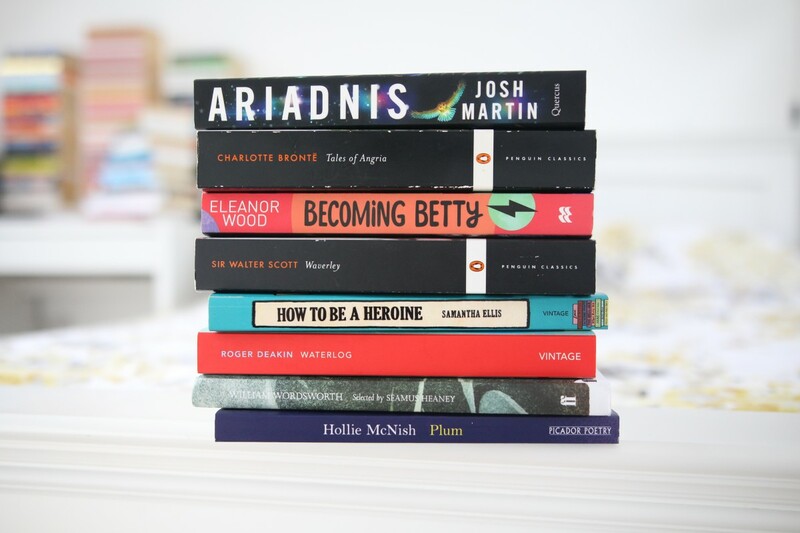 From Cathy Earnshaw to Lizzy Bennett, Samantha Ellis explores heroines from literature in the context of her own reading and life — how her perceptions of them have changed over time as she has changed as a person. From the parts of Take Courage, Ellis’s latest book, that I’ve read, I think I’m going to love the personal touches of her writing. In the introduction to How To Be A Heroine, she writes: “I wasn’t just reading about my heroines, I was reading the story of my life.” I can relate! Ever since reading Robert MacFarlane’s chapter on Roger Deakin in Landmarks, I’ve wanted to read Waterlog. It’s recently been published by Vintage Classics in one of their gorgeous red-spined editions, and is an exploration of the British Isles through water. Nature writing books are my favourite and the one thing I dream of being able to write one day, so I’m trying to read as much as possible to develop my own craft, but also because they’re fascinating too. I learn so much about our world and environment through them, and the thing I find most interesting is how everybody’s interpretations about similar phenomenon are always different. I don’t think I’m going to be able to resist reading Waterlog for long! I love Faber and Faber’s poetry collections, so when I was looking to read some William Wordsworth poetry I knew immediately the edition I would buy. Selected by Seamus Heaney, this edition contains over 40 of Wordsworth’s poems. Even though I’ve heard lines of Wordsworth’s poems and know of them, I’ve never actually read any of them in full. I love poetry, but I don’t read enough of it so I’m making it my goal for the rest of the year to read as much as possible. From the flick through I’ve done, I think Wordsworth will suit my tastes very nicely. Cherry Pie was Hollie McNish’s first collection of poetry (published under the name Hollie Poetry) and it was one of the books that got me interested in reading poetry. In this collection, Hollie McNish creates new poems out of old poems she wrote when she was younger — for example, the first poem takes a poem she wrote when she was eight, repurposed now that she is 30. I think she’s one of the best poetry talents in the country at the moment and I can’t wait to gobble up Plum in one sitting and then take my time when I go back through to discover the poems all over again. I was super lucky to receive a copy of Franklin’s Flying Bookshop for review, especially as I’m such a big fan of Jen’s YouTube channel. I’ve already read it and I thought it was wonderful: about a dragon called Franklin who loves reading, but is shunned by the other villagers. When he meets a girl called Luna, though, they start their own flying bookshop. If you know a child who loves books and reading, this would make the perfect gift. Even at 17 years old, I adored it and I’m not exactly the target audience! Jen’s poetic words and Katie’s illustrations work so well together to bring Franklin to life on the page, and I want to thrust it into the hands of all children (nicely) because they’ll love it. I’ve admired Goodnight Stories for Rebel Girls for a while now but wasn’t sure whether to buy it. When browsing Waterstones, though, and opening up onto the page featuring the Brontë sisters, I took it as a sign that I needed it in my life. It’s a collection of 100 pages featuring inspirational women from throughout history — from Jane Austen and Marie Curie, to Cleopatra and Michelle Obama. It’s written in an accessible way so it’s perfect no matter how old you are. I’ve seen parents buy it for their young children, but equally, people of all ages have been shouting about how good it is on my Twitter feed. It is on the pricier side, but I think it would make a lovely present and is worth every penny for the gorgeous illustrations and fascinating facts. What books have you bought recently? Have you read any of the ones on my pile? Share in the comments below! I can’t wait to read The Gentleman’s Guide to Vice & Virtue !!!!! Franklin’s Flying Bookshop sounds like a fun read! It was so fun book-shopping with you, Lucy. Let’s buddy-read Becoming Betty!